Just updated to version 1.3 with bugs fixes and enhancements! Thanks. Actually that's what I did at the beginning (having a separate keyword spot_mini to update the library.json file), but then I figured out that most of people will call the mini player by using an hotkey so they will be unaware of this way to update. So I preferred to put everything in the Settings. Maybe I'm missing something, but I don't get how it is easier like this? My library.json file is "only" 2.2Mb, and that remains fluid (see the video demo I posted to compare to yours). I personally prefer to have something really responsive for the tracks I listen the most (my starred playlist). When I want to listen for one of my playlists, I can search for it because i created the playlists.json file, and start the playlist quickly. So I was thinking to get from the library.json a subset in a library_starred_playlist.json which contains only starred playlist. This is technically possible to do that. Would that help in your case? Do not fetch online artworks for current track(for performance reasons). I've just been adding this in, looks awesome! while the library is updating I was just wondering if there's a quick way to export the information for the playlist json? I've got 100+ playlists and I don't fancy the idea of setting them all by hand. 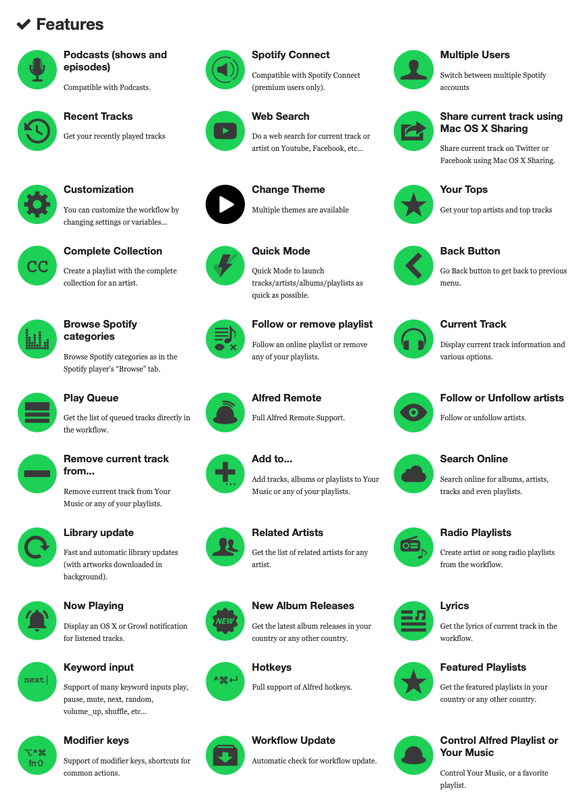 If you're using 100+ playlists, your library.json will be very huge. I suggest that you only use "starred playlist search scope only", otherwise you might hit perf issues. It's been going for a couple of hours now and while the play/pause/skip etc commands are working fine when I go to the actual mini player (spot_mini) to search etc I just get a "please wait..." message pop up in Alfred...is this just due to the library size and it not being able to cope? "Starred playlist search scope only" is active. That's weird because if you use "starred playlist search scope only", the json file used is "library_starred_playlist.json", can you check that you have one in same directory? I still haven't got a library_starred_playlist.json file though, how should this be generated? Does the mini player interrogate the library json and produce it itself? If it's only running off the starred_playlist will it only try to allocate that as opposed to the full library? Thanks for all your help, hope we can get this working. Yes it produces it itself if it cannot find it. This is where is it failing. I tried to send you a private message but apparently you can't receive it.. Please send me a direct message with a link to your json file. Updated allocated memory to 128M. It seems like the library is getting loaded into memory multiple times? as a 15mb json file should only take up 15728640 bytes. "You can make 5 more posts until Today, 02:19 PM. This restriction is in place until 24 April 2013 - 02:16 PM"
wow, I really need to reproduce using your json file...Can you post a link to you (zipped) json file here? Can you let me know once you have it so I can take down the link. Cheers for the help with this. done you can remove it! Ok I reproduced with your library.json and updated to 256Mb, everything works now on my side. Can you update to 1.12? V1.12 works for me too! Awesome! Thank you.